In life, there has been countless “Based-on-a-true-story” of bravery and sacrifice. Valiant efforts of a single individual or a collective group are commendable, saving lives in the process and showcasing true heroism in the face of overwhelming odds and adversity. Hollywood has taken a shine to this heroic effort, adapting a boundless supply of feature films that show their story through a cinematic lens. Of course, liberties are taken with the adaptation (usually to bolster the narrative’s drama to a movie quality level), but the core heart of the story is left intact. Such a tale has captured the eye of Walt Disney Pictures as they adapt the true life story of the “most daring sea recue in U.S. Coast Guard history” with the film The Finest Hours. Does seafaring rescue mission find its tonally heart or does the film get swept out into his own sea? In 1952, in the harsh snow-covered of Massachusetts, the S.S. Pendleton, a massive oil tanker ship, battles against raging winter storm at sea, causing the ship to spilt in two, with engineer Ray (Casey Affleck) facing the difficult task of keeping the surviving crew members alive as well as keeping the remains of the ship afloat. Back on land, meekly Coast Guard Captain Bertie (Chris Pine) is recently engaged to Miriam (Holiday Granger), a supportive woman who doesn’t fully understand of the what awaits her husband. When Pendleton is discovered a local, Commander Daniel (Eric Bana) orders Bertie to undertake very risky rescue mission, sending him and fellow crew members Andy (Kyle Gallner), Richard (Ben Foster), and Ervin (John Maagro) to almost certain doom. Facing the sea’s wrath with a small boat and pure naval prowess, Bertie sets out to locate the remains of Pendleton without the benefit of coordinates and rescue the surviving crew, while Miriam, struggling to understand the honor-bound duty of a Coast Guard, remains on edge alongside the community, hoping to see Bertie again. Like I said above, movies that are “based on a true story” (the ones that offer up plenty of courage and bravery) and usually pretty good, stirring up a lot of heroism and personifying in all in a dramatic fashion for its cinematic retelling experience. Films like Lone Survivor, American Sniper, 13 Hours, and United 93 are prime examples of this, with a strong emphasis on determination and bravery in the struggle of overwhelming odds. That was sort of feeling I got when I kept on seeing the trailer for The Finest Hours. Judging by the trailer, the movie looked intense and daring, so I was definitely curious to see the movie when it came out. Unfortunately, while I saw the movie on its opening weekend, I got bogged down with work and reviewing other movies. Thus, my review for The Finest Hours kept on getting pushed back…until now. That being said, The Finest Hours is a straightforward seafaring rescue mission that shows courage and heroism, but lacks depth. The Finest Hours is directed by Craig Gillespie, who previously directed movies like Fright Night and Million Dollar Arm. Gillespie takes to heart the gravitas of the real life account of Webber, Ray, and Miriam as their definitely a sense of sincerity and respect for the valiant efforts made in this story. The story itself is inspired by the real-life events that was depicted in Casey Sherman and Michael J. Tourgias’s book titled “The Finest Hours: The True Story of the U.S. Coast Guard’s Most Daring Sea Rescue”, so the movie’s premise has some profound weight behind it and (because it’s based on something that really happened) makes it that much more endearing to watch. What I liked about The Finest Hours is that it sort felt like a brazen throwback to the Hollywood’s old-fashion approach to stories of honor and bravery (a lot of movies that were produced during Hollywood during the 1950s). The movie might make the events slightly larger-than-life, but it doesn’t take away from recounting the valiant efforts that were made in this rescue mission. In addition, the usage of CG visual effects aids the movie’s believability with scenes that show the turbulent sea of giant-pounding waves and wrecked ruined ships. Even the practical effects are helpful, dosing its characters and set pieces with a deluge of water in many of its scenes. While unwavering courage and CG visuals help propel the story forward, The Finest Hours has a couple problems into its daring rescue mission exploits. In all truth and honesty, there isn’t much to the film’s story, playing out as a standard (and somewhat tried and true) rescue mission at sea. Its direction is very straightforward and comes across as something slightly cliché, drumming up the commonplace heroic rescue troupes found in these types of movies. The movie’s heart is in the right place, but, it doesn’t resonate as strongly as it could be. Furthermore, since the movie focuses on the events of the rescue mission, the movie lacks character development for its various characters, including its main ones. Thus, the characters are somewhat stereotypical in nature. Even events that transpire before or after the film’s main story, are brush to the wayside. In short, The Finest Hours, a movie that depicts the most daring rescue mission in is U.S. Coast Guard History, is far less dynamic and well-rounded than its real-life account that people that played their parts in its telling. The Finest Hours’s cast is a diverse cast, including some well-knowns, with most of them performing with a Boston / New England accent (some pull off better than others). Sharing the spotlight, Chris Pine and Casey Affleck are the movie’s two main leads, sharing protagonist duties in their respective roles. 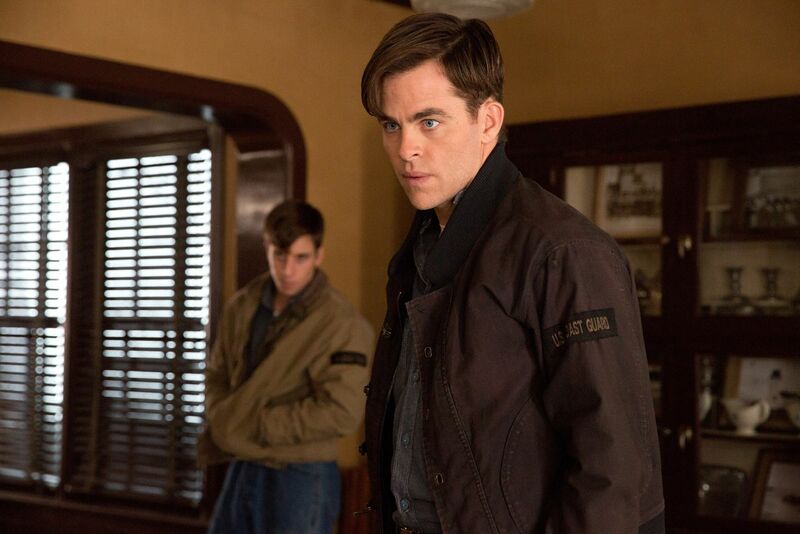 To me, Chris Pine has the more interesting role of the two as Bernie Webber as Pine, who usually plays smarmy and arrogant characters like in Horrible Bosses 2, This Means War, and the new Star Trek franchise, his role in The Finest Hours as the meekly mannered (but still courageous) coast guard is a refreshing take Pine’s acting catalogue. Casey Affleck plays the film’s other main (and reluctant) hero Ray Sybert. Affleck seems to get into the character with great ease and does a fine job in the role. In more supporting roles, actress Holliday Granger plays Miriam, Webber’s finance and the film’s love interest, and does a serviceable job, going off of her own personal storyline in The Finest Hours. However, most of her plot seems just to fret and worry. Eric Bana’s Daniel Cluff, a by-the-book-USGC Warrant Officer, gets the job, even if his accent is a little horrendous. The rest of the cast offers some recognizable faces, including Graham McTavish, Ben Foster, Abraham Berubi, John Maagro, and Kyle Gallner, but their characters are not developed enough beyond the two-dimensional role, despite give some quality performances. As a final note, I did see The Finest Hours in 3D (I would’ve have to wait to see the standard 2D version) and, while it sort of helps with some scenes that require visuals representation, it wasn’t a “3D must”. Truthfully, rendering the movie in 3D wasn’t the particular best idea as the movie already dark (color palette-wise) and adding the 3D overlay (wearing the 3D glasses) darkened the picture even more. It was actually hard to see where certain things at various points. Dangers on the high sea, a valiant rescue mission, and the survival of hope make up the elements found in the movie The Finest Hours. Gillespie’s picture is a respectable drama pays homage to the old school days of Hollywood narrative of brave men fighting through titular events and titanic odds, while also paying tribute the valiant efforts of true life events that inspired this movie. While the feature’s intent is clear and pure, the movie just merely a “paint-by-numbers” in its storytelling, lacking pace and a well-rounded premise for it characters and its story. Personally, it was a good story (true heroism through and through), but just didn’t resonate strong enough with me. Still, The Finest Hours is a fine and suitable choice as rental when its gets a home release later this year. Good review. It was a fine movie. And that’s about it. Hey, there. Thanks for writing. Yeah, that’s pretty much it. It was good, but not worth buying or watching repeatedly. I too am waiting for the DVD release. There’s nothing wrong with some high octane heroic entertainment every now and again, as long as you know and expect it from the movie. Nice review! Looking forward to reading more of your posts. Hey, there. Thanks for writing. The movie was good (and respected the real life story), but it need something more. All in all, a good movie rent and seeing once or twice.